The football footage of Charlton v Bolton W and Cardiff C appears to have been shot in the 1954-55 season. Some priceless footage. Including quite a few shots of Hewie, Leary Hurst et al. It looked like The Valley, with a bit of Craven Cottage thrown in. Burnden Park is where the train pulls up near the end but the action they watch is at the Valley! Watched this film years ago on tv as a kid couldn’t figure out how there was a railway line behind the south terrace now I know, it’s something that has puzzled me for over 50 years. Likewise I saw this on TV way back in the early 70's, and remember the train pulling up right behind the terracing! Looking at it now...and seeing it was "filmed in Beaconsfield Studios"...my assumption is that it was shot in London + SE. 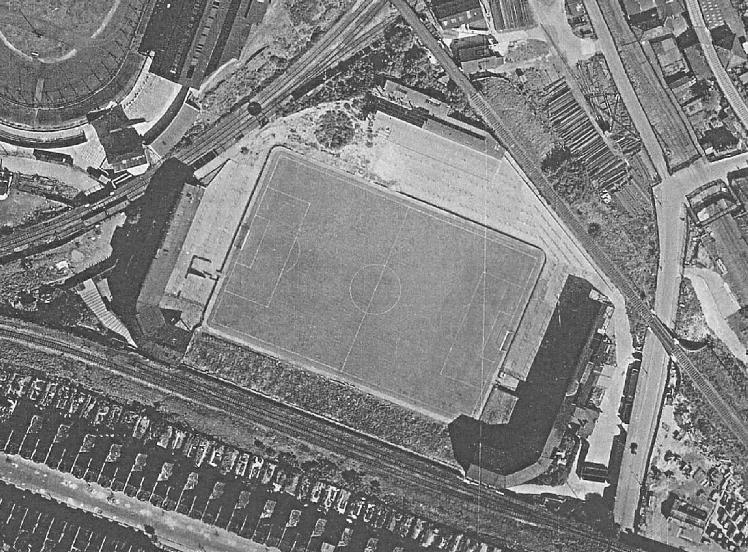 Until 1964 the old Den was formerly surrounded on 3 sides by railway lines, one of which ran right behind a bank of terracing. My guess is for that shot they might have just moved the crew and some extras to Cold Blow Lane? What a Charlton Lifer's dream. Not only footage of 1950s Charlton matches ..... but steam engines too!